Santa Maria Airport has the longest commercial runway on California’s Central Coast, between LA and the Bay Area. The airport began in the early years of WWII as an Army Air Field. After the war, as happened at thousands of other locations, airport ownership was transferred to the local municipality. In 2011, the airport averaged roughly 130 operations per day, with a contract control tower open 14-hours daily. The airport is home to more than 200 mostly small GA aircraft. This airport is a good example of enormous underutilized air capacity. The airport has had passenger service from different airlines, off and on, but its growth continues to be constrained by the larger hubs. That is, the concentration of airport funds into hub-and-spoke airports (like San Jose San Francisco, Burbank, LAX and Orange County) draws passengers away from locations like Santa Maria, and into long car commutes to use the larger airports. Consequently, the KSMX airport management has to be content to receive roughly $1,000,000 each year*The bulk of these funds come from passenger taxes at all airports. Any airport with 10,000+ annual enplanements is awarded roughly $1M for that year. Recent KSMX data shows 85,000 enplanements, thus an AIP award of roughly $12 per passenger is fueling more runway development at KSMX. from FAA’s AIP fund, which they then use to fund more construction, and make the airport even more underutilized. The most recent addition was to extend the main runway from 6,300′ to 8,000′, using AIP funds. * That extension opened in May 2012. Six months later, Allegiant began one flight per week to Hawaii, using a Boeing 757. The only other scheduled carrier is United Express, with four daily flights to LAX. The airport now occupies nearly 2,600 acres in an area noted for exceptional farm productivity. FAA compiles ATADS data for this facility. Airport operations in 2012 were DOWN 39% vs. 2007 operations, and DOWN 50% from the peak year (1990). 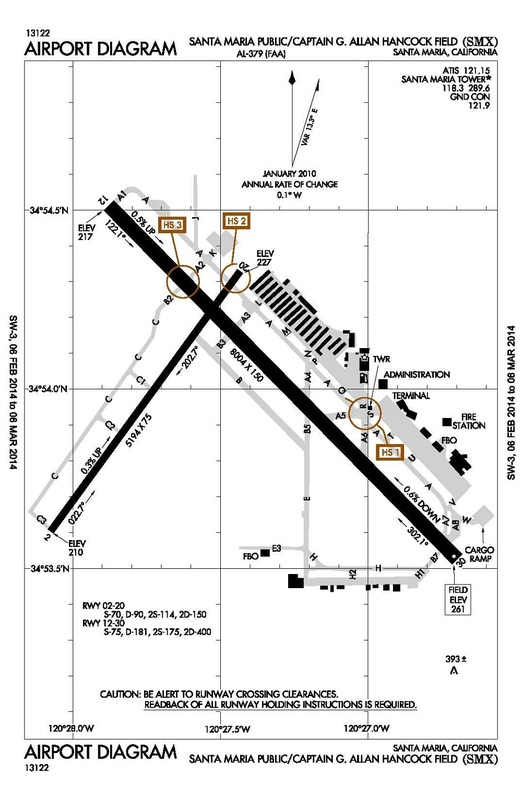 …Controllers and pilots are upset that their taxiway designations were changed by FAA, in a move toward standardization. 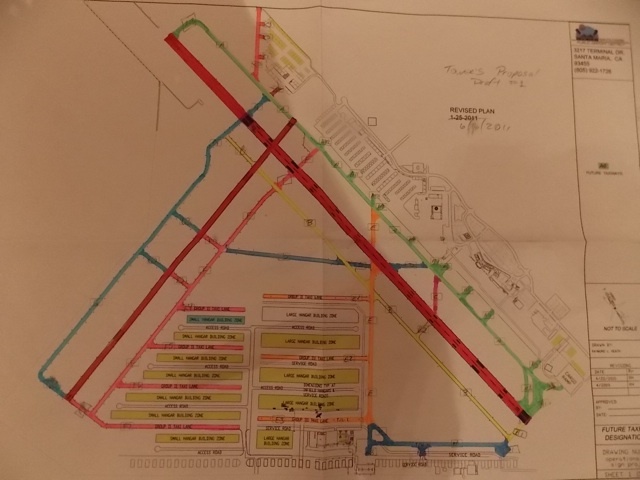 The article also says $225K was spent just to ‘study’ the labels used on the system of long parallel taxiways and short stub taxiways (that link the runway to the main taxiways). See the previous airport diagram at this link. …A color sketch attached to the 6/20/13 GANews article. …More than $4.1M in Federal AIP funds will be used to add 1,700′ to the northwest end of Runway 30. This will enable use by larger aircraft, such as the Boeing 757.